Welcome to the Cedar Hill Lions Club! The Cedar Hill (Texas) Lions Club meets at the Good Shepherd Church at noon on the 2nd and 4th Tuesdays of every month (December - 2nd Tuesday only). Please join us as we serve our community. 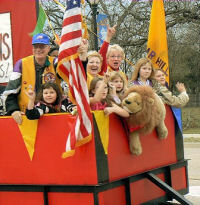 Cedar Hill Lions Club members are local business people, educators, professionals, government officials, retirees, and others who wish to serve our community and the world we live in. Copyright © 2019 Cedar Hill Lions Club. All Rights Reserved.